I first made this dish for an Italo-disco wine dinner at Bar Liberty and it's been on the menu ever since. I love it. The first time I had it was at Lupa in New York when Mark Ladner, the world's best pasta chef in my opinion, was cooking it. It reminded me of biscuits and gravy and I was hooked. As a dish, it sounds simple, but it's trickier than it sounds. I like to think of this more as a technique than a recipe, but the following gives you a good guide. 1. Have all of your utensils and ingredients ready to go, especially your diners. This is a recipe that seems simple, but the emulsification of the cheese and starchy pasta water can be trickier to achieve than you think and as soon as it's ready, you have to eat it or it will start to split. 2. In a large pot put your pasta water on to boil with the salt and semolina flour added. Once boiling, add the pasta and simultaneously start to toast the pepper in a pan large enough to hold your cooked pasta. 3. When the pasta is just under al dente, drain, conserving the water. Return the pasta to the pot to keep warm. 4. Add 650ml of the reserved pasta water to the pepper along with the olive oil (it will bubble violently). 5. Reduce pepper mixture by about two-thirds. 6. 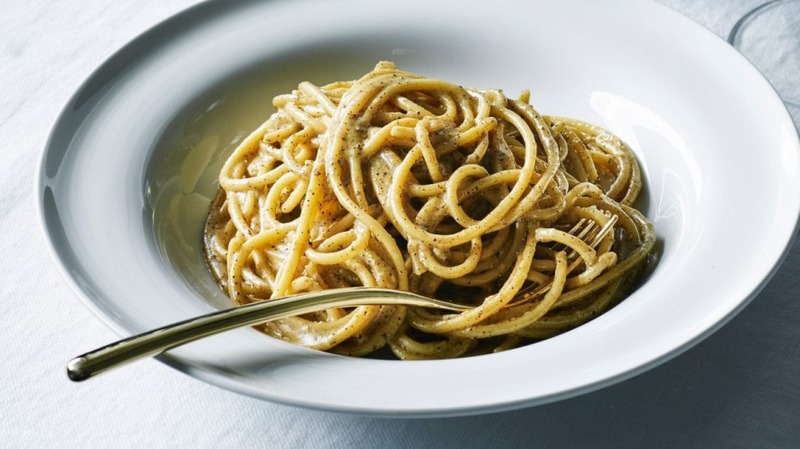 Working quickly, add the cooked pasta, then the pecorino and stir rapidly until the cheese and liquid emulsifies into a sauce that coats the strands – you may need a little extra pasta water. Serve immediately. *this additional starch helps emulsify the sauce. The Good Food Guide 2019 is on sale in newsagencies and bookstores or order via thestore.com.au/gfg19 (delivery included), RRP $29.99.